When you wake up exhausted in the morning wondering if it's time to get up and go to work, the last thing you really want is your smartphone's bright display blinding you while you check the time. So the snap-on Clockety turns your iPhone into a projection alarm clock, displaying the time on your bedroom ceiling with a quick tap on your device. 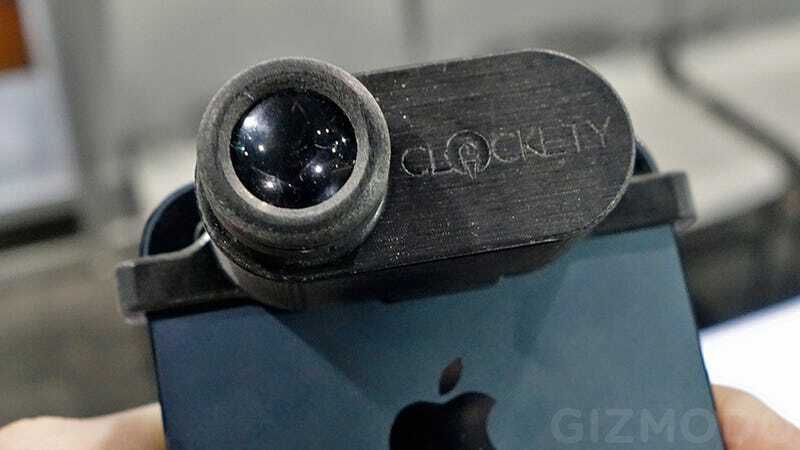 Specific versions of the Clockety will be available for the various iPhones because the accessory actually uses your phone's camera flash to project the time. So it's crucial for the Clockety's small transparent LCD display to sit directly above your phone's flash. This also allows the Clockety to have a small but long-lasting battery—because all it's doing is keeping track of the time and powering a tiny basic LCD display. To activate the Clockety and your iPhone's flash, an accompanying app uses the phone's accelerometer to detect a simple tap. In the middle of the night all you need to do is reach over, tap your iPhone or nightstand, and the time will be projected for a pre-set time. It really couldn't be easier for your 4am self to use.